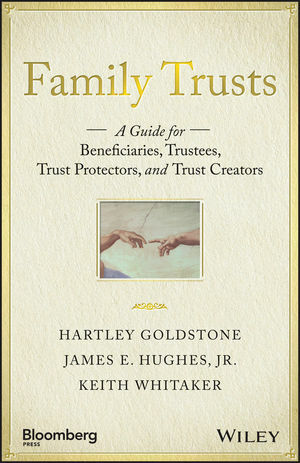 Family Trusts is a step-by-step guide for anyone involved in family trusts: trust creators, trustees, beneficiaries, and advisors. It will help families create and administer a culture that recognizes trusts as a gift of love. Marrying the practical and emotional aspects of family wealth, this book provides a hands-on primer that focuses on fostering positive relationships, and structuring the trust appropriately for the situation and the people involved. It tackles difficult topics with frank and honest discussion, from the first beneficiary meeting to working with addictions, and more. Written by a team of experts in family wealth, this information is becoming increasingly crucial to the successful execution of a trust; you'll learn what type of person makes the best trustee, how to be an excellent beneficiary, and the technical aspects that help you build a better trust from the very beginning. There's been a staggering increase in trustee/beneficiary litigation and hostility, but that doesn't mean it's inevitable. Plenty of trusts are running smoothly, with positive experiences on all sides. This book shows you how to set up your trust to succeed from the start, with step-by-step guidance and expert insight. Historically, there has been little consideration given to the culture of trusts, and this oversight may be a key driver of the behavior that's becoming more prevalent. Family Trusts explores the nature of these relationships, and shows you how to build a trust that retains the nature and spirit with which it was intended. HARTLEY GOLDSTONE, JD, MBA, works with institutional and individual trustees, family offices, and beneficiaries in all stages of life to identifyand then achievepositive possibilities in the relationship between beneficiary and trustee. A Research Fellow with Wise Counsel Research, Hartley is the co-author of TrustWorthy: New Angles on Trusts from Beneficiaries and Trustees, and a popular speaker about flourishing "trustscapes." JAMES (Jay) E. HUGHES, JR., is the author of the acclaimed classics Family Wealth and Family: The Compact Among Generations, and the co-author of The Cycle of the Gift: Family Wealth and Wisdom and The Voice of the Rising Generation. He has also written numerous articles on family governance and wealth preservation. A Research Fellow with Wise Counsel Research, Jay is a frequent speaker at symposia on the growth of families' human, intellectual, social, spiritual, and financial capital. DR. KEITH WHITAKER is founding president of Wise Counsel Research, a think tank devoted to studying wealth and philanthropy. Keith has many years' experience helping enterprising families communicate around estate planning and charitable giving. His writings have appeared in The Wall Street Journal, The New York Times, and the Financial Times. Keith is the co-author of The Cycle of the Gift: Family Wealth and Wisdom, The Voice of the Rising Generation: Family Wealth & Wisdom, and Wealth and the Will of God. By James E. Hughes Jr., Esq.